Not all hazmat absorbent pillows are created equal! What is one of the most commonly used tools when there is a small reactive chemical spill or leak during routine maintenance? Generally, hazmat absorbent pillows are the immediate go to for these types of spills and leaks. Pillows are the ideal tool because they can soak up large amounts of fluid. But you can also mold them to fit tight corners. Additionally, you can place them on top of a spill that is being contained with a sock or boom. You can really use Hazmat absorbent pillows in many situations. Be of course with all the good, must come the bad, right? Before you call your supplier to stock up you must know that not all hazmat absorbent pillows are created equal. Most hazmat absorbent pillows are made with a tough outer layer of polypropylene that will attract the spilled chemical into the pillow. But then what about the inside? Will the absorbent form a permanent solid? Will it reduce or eliminate fuming or vapor production? There are certain features you should look for when determining the type of sorbent you need in your hazmat absorbent pillow. 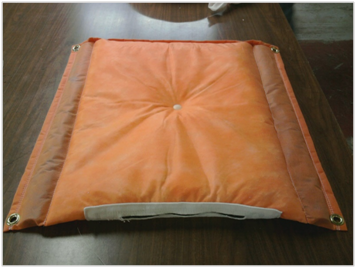 Most standard hazmat absorbent pillows are filled with polypropylene. When choosing your hazmat absorbent pillow, you first want to take into consideration the type of chemical you are working with and whether it is reactive or not. Then you will want to find a pillow that has the ability to not only absorb the spill but will reduce or eliminate vapor production. Lastly you need to consider its ease of disposal and the environmental impact of disposal. If you work with water reactive chemicals for example such as Ticl4 or chlorosilane, you should look for a hazmat absorbent pillow that will not only absorb the liquid chemical physically but help prevent it from hydrolyzing. This will reduce the chemicals capacity to create acid vapors. Thus, making the spill cleanup process safer and more cost effective. The PetroGuard inside our absorbent pillow will not only absorb the chemical, it will solidify it. It also prevents any further hydrolyzing of the chemical, without any chemical reaction taking place. The holding capacity of the sorbent is probably one of the most important features of the pillow. Often times when a standard sorbent like polypropylene becomes saturated it loses its ability to continue soaking up the fluid and frequently leaches its contents. This leads to needing to use more and more product, just to clean up the spill. A real waste! So look for the chemical absorbent pillow that is filled with PetroGuard solidifying sorbent that is known for its quality, speed, capacity and efficient absorption. Lastly how you dispose of used sorbents depends on the type of liquid it contains. In some instances you can incinerate sorbants and others may require hazardous waste removal to a landfill. Sorbent disposal varies at both the state and local levels. It is best to check local, state and federal regulations regarding the disposal of used sorbents. Always check before you ever have to use them. Better to know in advance than to be stuck with a potentially dangerous items and nowhere to dispose of it. Having the right products and solutions on hand can help increase the effectiveness and safety of your maintenance and spill control programs. Guardian Environmental Technologies strives to provide the most effective spill mitigation products for efficient chemical spill cleanup. We have years of industry experience, allowing us to navigate supply-chain operations and objectives that benefit our clients. Contact us today at (860) 350-2200. Let our innovative solutions keep you safer and save you money.